Can Exercise Decrease the Risk of Macular Degeneration? An estimated 11 million Americans have macular degeneration, and with an aging population the number of new diagnoses are expected to sky rocket by as much as 50% by 2050. As the leading cause of blindness in Americans age 60 and older, we are still without any cures for this blinding eye disease. 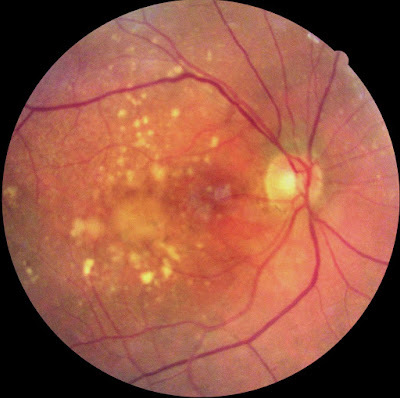 The mainstay of treatment in the early (dry) stages of macular degeneration is all about preventive care -- sun protection, stopping smoking, and nutritional supplements have all been shown to reduce the risk of progression. A 2014 study published in the Journal of Neuoscience suggests eye doctors should be adding at least one more recommendation to that list -- regular exercise. Macular Degeneration causes permanent disruption to the retinal tissue and central vision loss, and unfortunately in many people it continues to worsen despite the best treatment options available today. The premise behind the study is one that eye doctors hold very near and dear in concept -- the eye is a part of the neurological system, made of the same tissue that comprises our brain and central nervous system. Aerobic exercise has already been proven to be both protective and rehabilitative in neurological diseases, improving memory in those with Alzheimer's and nonmotor function in Parkinson's. Could exercise also be neuroprotective or rehabilitative in eye disease? 48 mice were divided into different treatment groups and macular degeneration was simulated by using Light Induced Retinal Degeneration. 24 mice were placed in the "exercise" treatment group: they used a treadmill 5 days a week for 60 minutes each day at a set speed. These mice were "pretreated" with a 2 week regimen of exercise, then were exposed either to toxic bright light (10,000 lux) for 4 hours to cause Light Induced Retinal Degeneration or dim light (25 lux). Another 1-2 weeks of exercise followed. The other 24 mice were placed on a non-moving treadmill for the same 60 minutes a day, so no active exercise occurred. They were then exposed to to either the toxic or dim light stimulus and maintained without exercise for 1-2 more weeks. Retinal function was measured using ERG responses at the end of the four week period. As predicted, toxic bright light exposure (10,000 lux) resulted in significantly worsened retinal function. 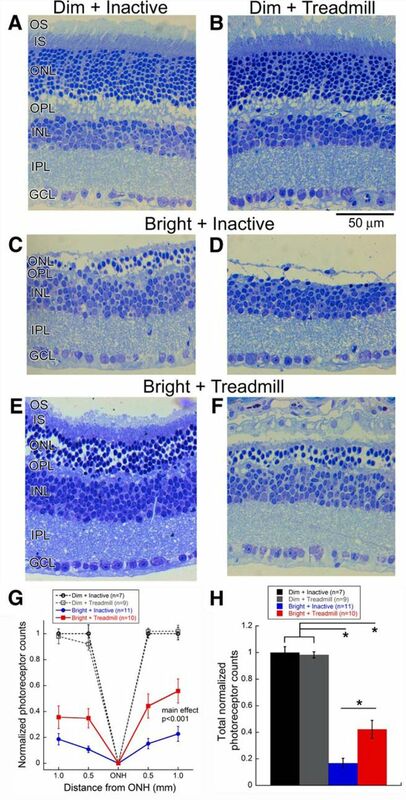 But even in those mice undergoing toxic light exposure, the mice who had received pre and post-exposure exercise had much better retinal function than the stationary mice. 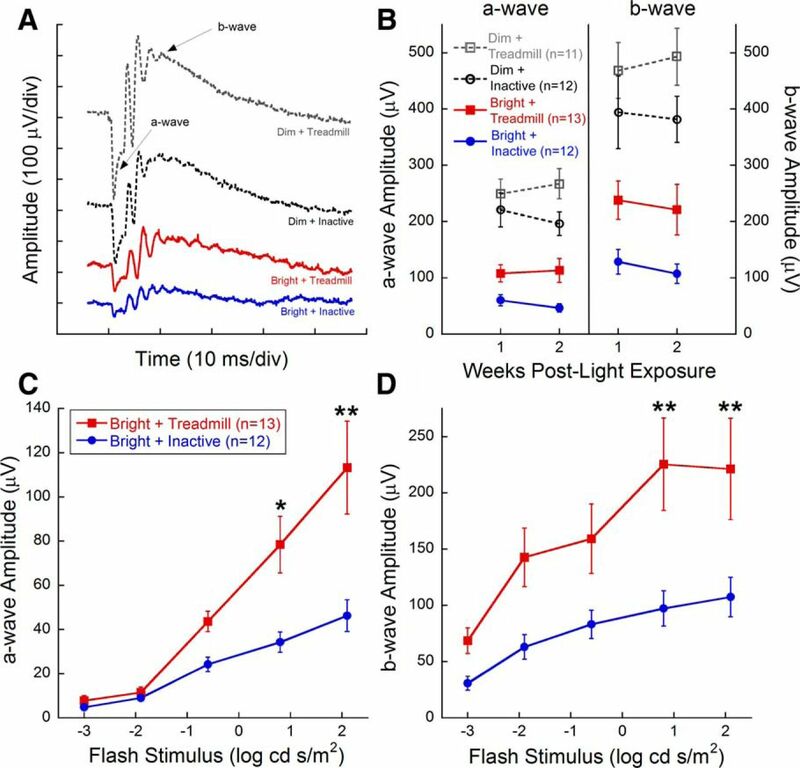 Interestingly, the mice that were exposed to dim (non-toxic) light had better retinal function if they were exercised than if they were not. Could exercise also improve retinal function in normal eyes? Possibly, according to this data. A) Toxic Light Exposure mice had greatly reduced ERG amplitudes compared to those exposed to dim light, but in both groups, the exercise mice had better retinal performance than their non-exercised cohorts. Structural changes to the photoreceptors were also found. 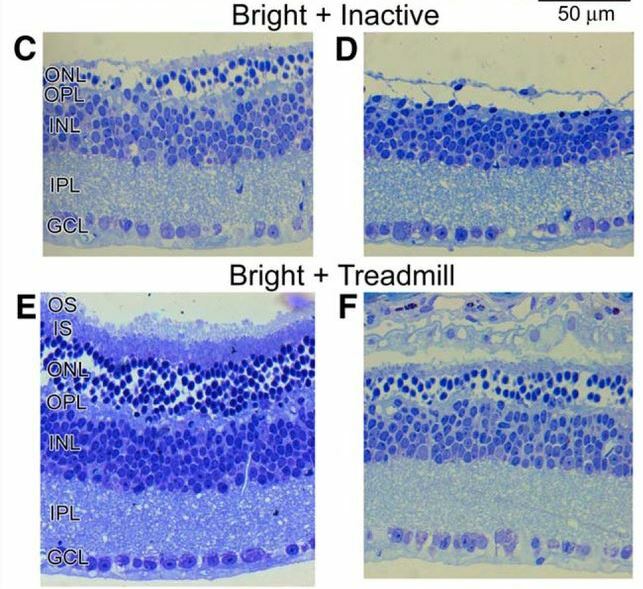 In the mice exposed to dim light, there was no difference in the number of photoreceptor cell nuclei in the the exercise or non-exercised groups. 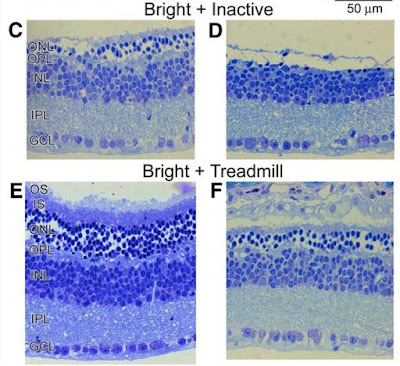 But in mice exposed to toxic bright light, the exercised group had preserved photoreceptor nuclei, while the stationary mice lost approximately two rows of photoreceptor nuclei and suffered tissue disorganization. The data very clearly implies that aerobic exercise can help our retina better withstand degenerative events. Researchers theorized that brain derived neurotrophic factor (BDNF) was the essential protein activated with exercise that had neuroprotective benefits. Could BDNF be isolated outside of exercise to help in the treatment of conditions like macular degeneration? Previous studies have shown unwanted side effects with the injection of neurotrophic factors, so at this time exercise is the best and safest way to activate the protein. We don't yet know how much or how long a person should exercise in order to produce enough BDNF to be effective. The results are convincing enough that I now add exercise to my list of recommendations for how patients can help prevent macular degeneration progression, along with wearing sunglasses, not smoking, and nutrition/AREDS 2 vitamins. It's also a great recommendation for people with genetic risk factors for macular degeneration -- this study implies exercise can protect against retinal damage, so starting regular exercise while the eyes are healthy could be essential to protecting life long vision.